The web server used by Cep-rec.eu is located in Kempten, Germany and is run by IDKOM Networks GmbH, Kempten. On this web server 13 other websites are hosted. The language of those websites is mostly german. 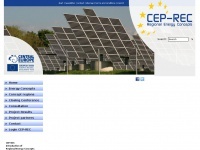 A Apache server hosts the websites of Cep-rec.eu. For managing the data of the webpages the CMS TYPO3 in the version 4.5 is used. XHTML 1.0 Transitional is used as markup language on the webpages. Indexing the data of the website and following hyperlinks on it is explicitly allowed by robot information.